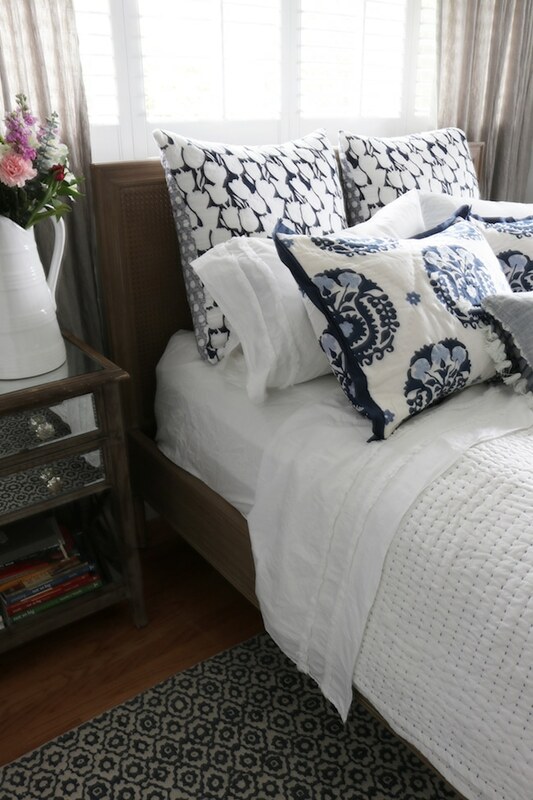 Master Bedroom Makeover – New Bed, Rug & Bedding! 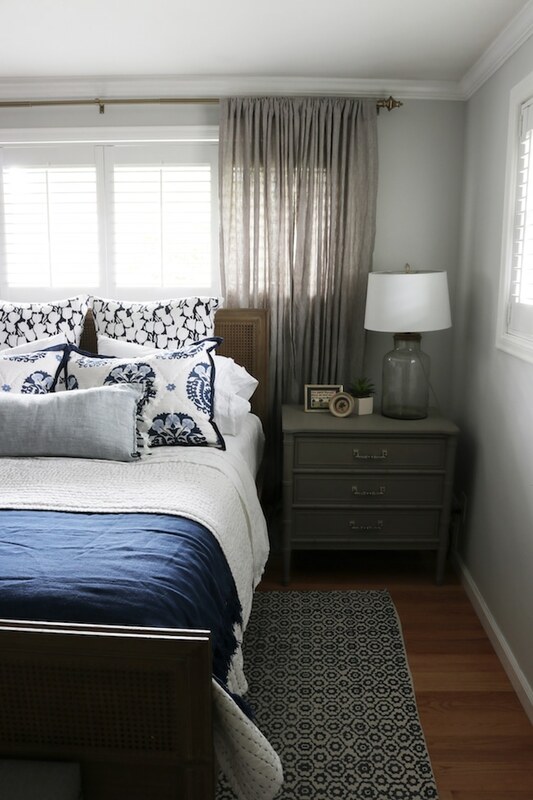 We made big progress on our Master Bedroom Makeover! Our new bed, bedding, and rug arrived and I’m so in love with it all. 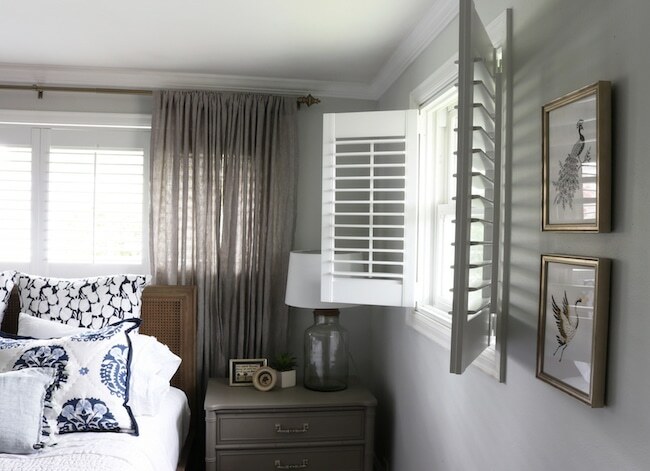 You’ll even get a peek at our new shutters in this post, but I’ll come back another day to share more details on them. If you’re new here and just catching up, we moved in to our house in Seattle about two and a half years ago. 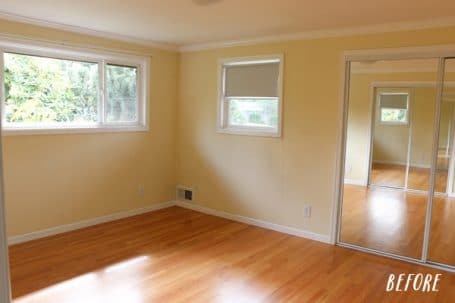 When we moved in, the small bedroom designated as our master had yellow walls. As cheery as it was, I was excited to paint our room and make it more cozy. At first we choose a deep plum color that really made this little room feel like a cocoon. We LOVED it! Moving and remodeling is always such a long stressful process, was so nice to have a retreat that was safe and snug for the past two years. But the time came where we were really make this space our own. We remodeled our kitchen top to bottom, knowing it would become the style setter for the rest of our home. I love when a house starts to come together and feel more cohesive as a whole. It’s always fun to see that happen! My mom was ready for me to give her sleigh bed back (the one we’ve used for the past few years). 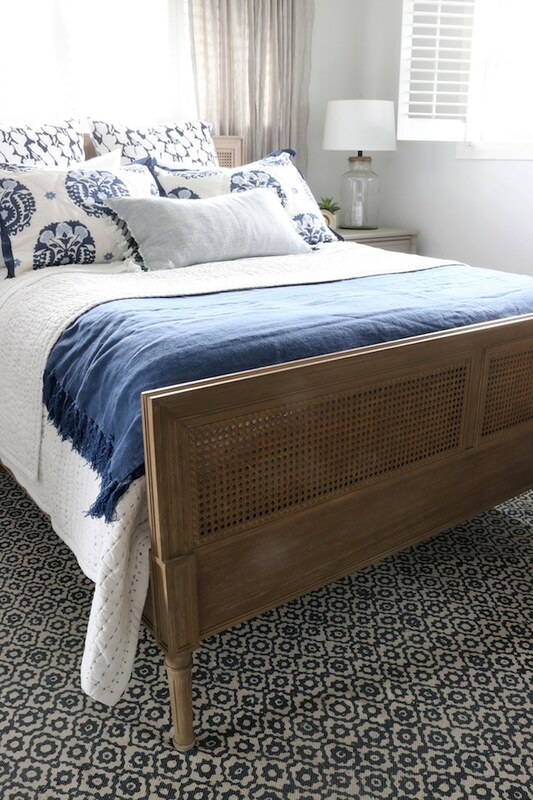 I’ve had this cane bed from Serena & Lily on my dream room board for a long time! I adore so many things about it. Besides the classic look and cane detail, it’s really the perfect scale for our little room (which is 12 x 14, I know some of you have asked the size!). Our other bed was nice but it took up a lot more space visually, as it was curvy, bulky and dark. This one is much more streamlined with a straight headboard and footboard that fits in so nicely in the room. I also love that it is taller off the ground with daintier legs. It’s amazing how much more open it feels visually in the room now that we are able to see the rug nearly almost all the way under the bed. The footboard is just high enough to keep our pup Lily from tumbling out of bed at night, but not so tall that Jack injures himself trying to take a flying leap over it. It’s really perfect! I love that the wood and cane and the white and blue reflect the direction we’re going with our home. As our home continues to come together, we’ll have a subtle, clean but fun, relaxed coastal edge to every room (which we love and also makes sense with our location facing Puget Sound. Puget Sound is an inlet of the Pacific Ocean, and part of the Salish Sea.). 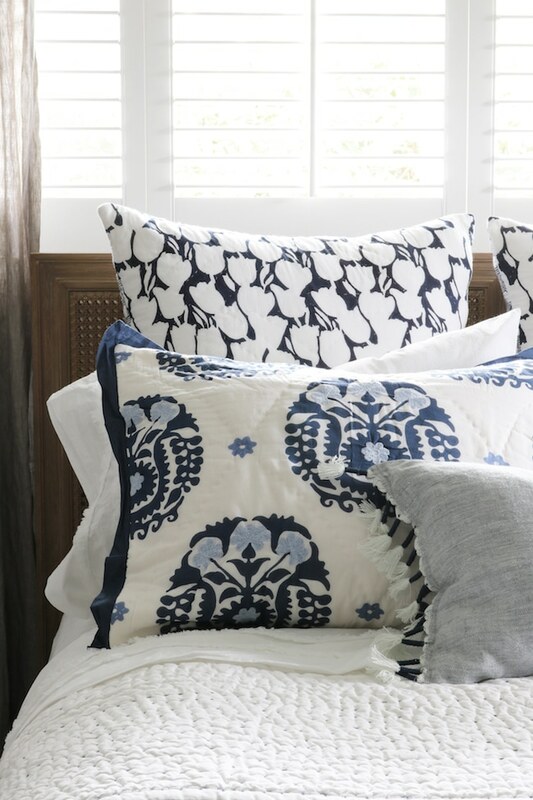 The bedding is fun wonderful, I love the subtle details such as fun pattern on the shams, the fringe on the sheets, stitching on the quilt, and tassels on the throw. And the whimsical Dhurrie rug is perfect! 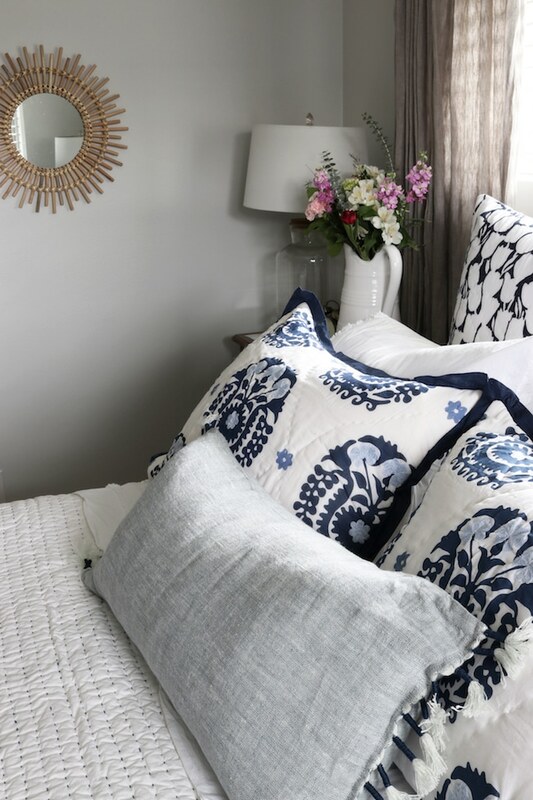 It lends softness, pattern and pulls the home room together. Also, the sheets are so deep I could actually fit them around my huge mattress without a struggle! We feel great about our progress! There are still a few more things we plan to update and would like get done at some point (we’re still deciding on our mirrored closet doors, for instance), but I think we are at a good stopping point for the time being. This room feels so serene, comfortable and welcoming! Want to be reminded where we started? You’ll find more on our new paint color here. As you can see, we installed our new shutters! You can find details on them here and see how to order the shutters with a special referral link and discount code. 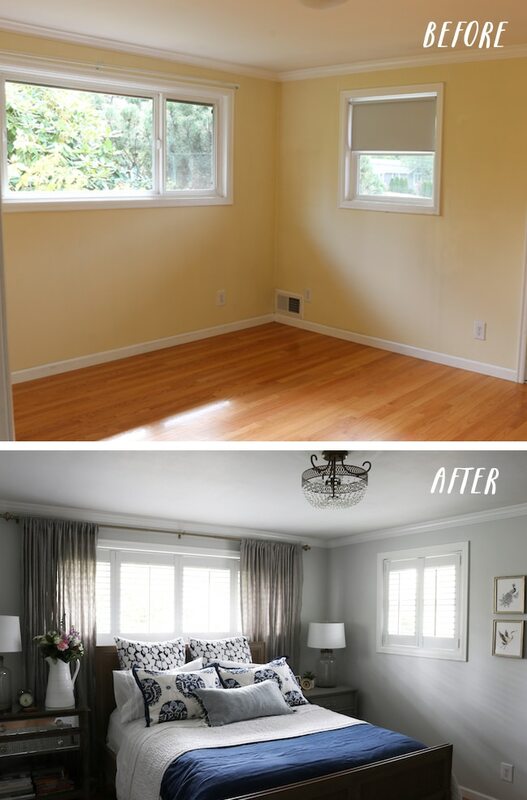 We’re so happy with the transformation of this room! 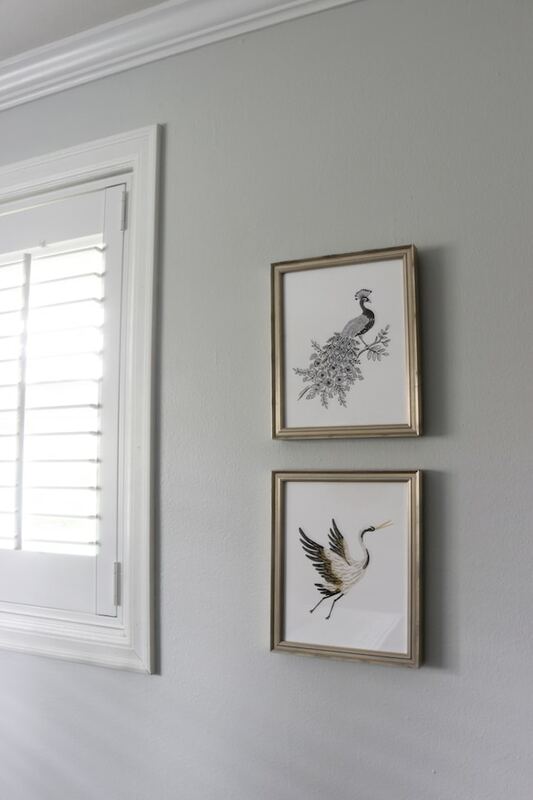 Love the bird prints, where were they sourced from? I love the new bed. Sleigh beds are really pretty, but in this case your choice is perfect for opening up the space. The shutters really streamlined the room as well. I like the idea of mirrored closet doors. They are so 80’s as I have them in all of my rooms. At first I hated them and wanted to change them out. Over the years, they grew on me and I love them. Love all of the changes. Is the blue in the rug a true blue, or is it more of a slate blue? Looks great! Is there a dresser in there for clothing … Just curious. My master is enormous (was added by previous owners) and that is almost more challenging to decorate than a smaller room! This turned out beautifully! 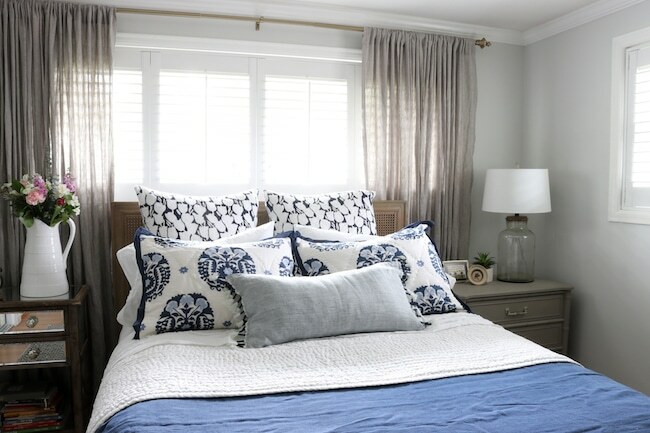 I am in love with that flower vase and how to flower colors tie in with the blue! So pretty, love it! Beautiful room! Love your style!! What a beautiful space. Lovely choices. Nice work!! I like the room so much better now it feels finished, plus Serena & Lily are one of my favorite design boutiques. Beautiful job! 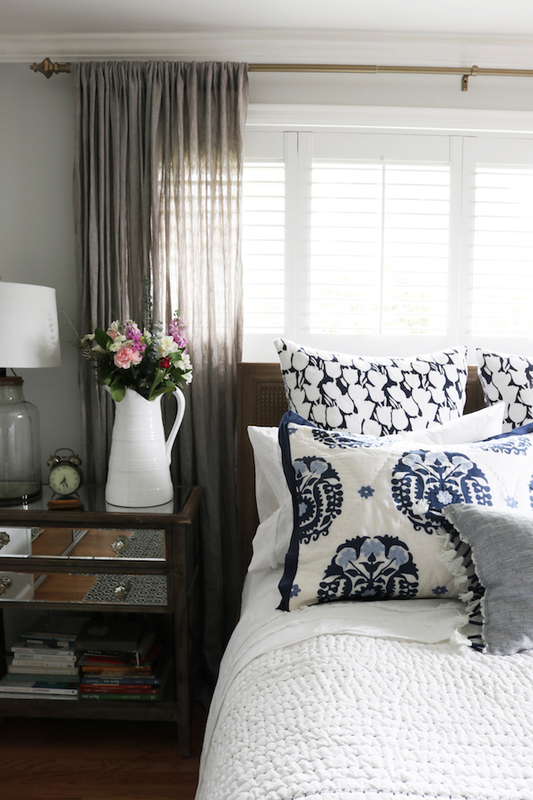 Love the navy and white pillows. So crisp and classic! So pretty! Those window treatments are perfection! I love it and I like that it does not look like a 12×14 room. Great job. Very nice job on your bedroom ! So calm and serene …. with a great coastal vibe. I think the new color makes the room appear larger! 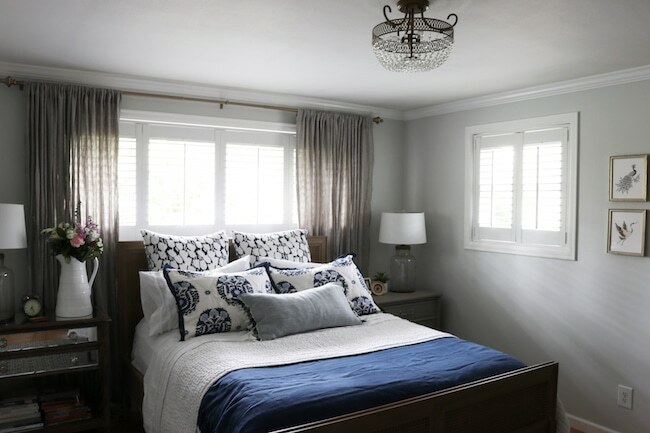 Love the rug and bedding… oh and the shutters, perfect!! we also chose a cane bed. We are very happy with the cane. Wow! What a difference! Looks so serene, and I love the bed! Love your new bed and bedding choices. They really do flow with the rest of your home. But the main takeaway from this post was …. Lily and Jack BOTH sleep with you??? And how is that white bedding gonna hold up to their shenanigans? Beautiful transformation, Melissa! 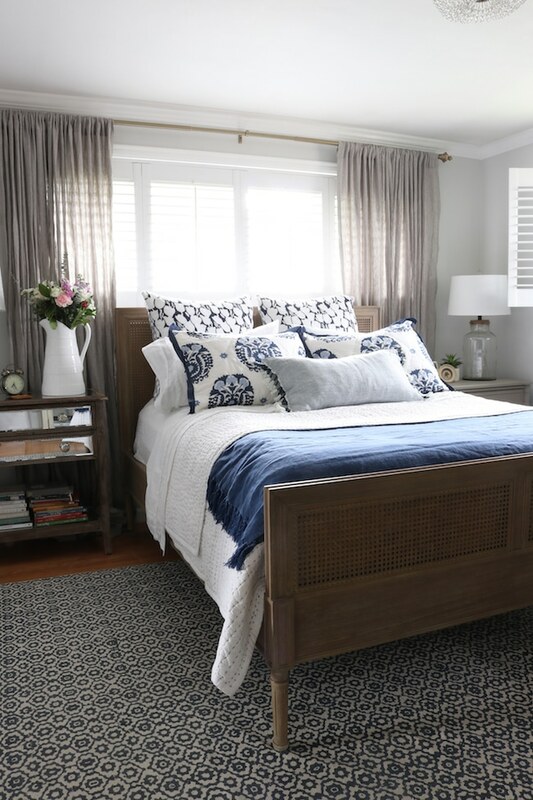 The rug and shams are my favorite accessories with their light-hearted feel. The shutters are jaw-dropping gorgeous! And could not be more perfect!! Oh, how I wish I had seen this when we had a home of similar age and style. Figuring out what to do with high windows like these in our bedrooms drove me crazy (Ours were awning windows which was worse.) This is the perfect solution! What color is the paint on the walls? Light grey? I love it with all the dark blue. Very refreshing. Did you make your curtains? What is the fabric? Your bedroom looks so beautiful! I love the white shutters! 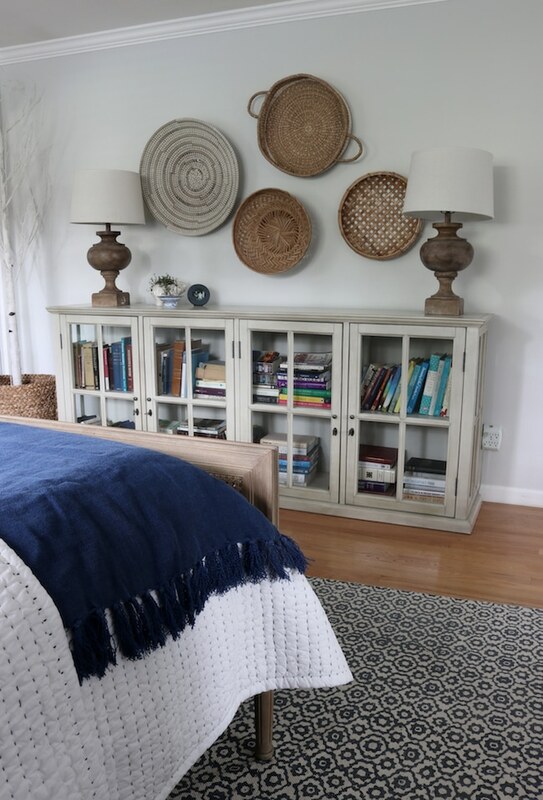 Your room looked beautiful before too, but I can see how you wanted the room to flow with the coastal look of the rest of your home. Very Nice!! Love the look of the bedroom. Reiterating question from Kelly: did you make the curtains and what is the fabric? Thank you. Adorable collection I am so happy to see these beautiful features and collections. Thank MELISSA for sharing have a good day. I’d like to know where you bought the glass door console. I’ve looked in your earlier postings and did not find any information. Could you please let me know? thanks. I got it at Restoration Hardware a few years ago! It’s called the Hampton Glass Casement Sideboard and mine was in the color Antiqued Taupe. Looks awesome! I always love a blue andwhite color combo. I would love to know where the curtains are from?! So lovely! Also, you are such a great teacher! 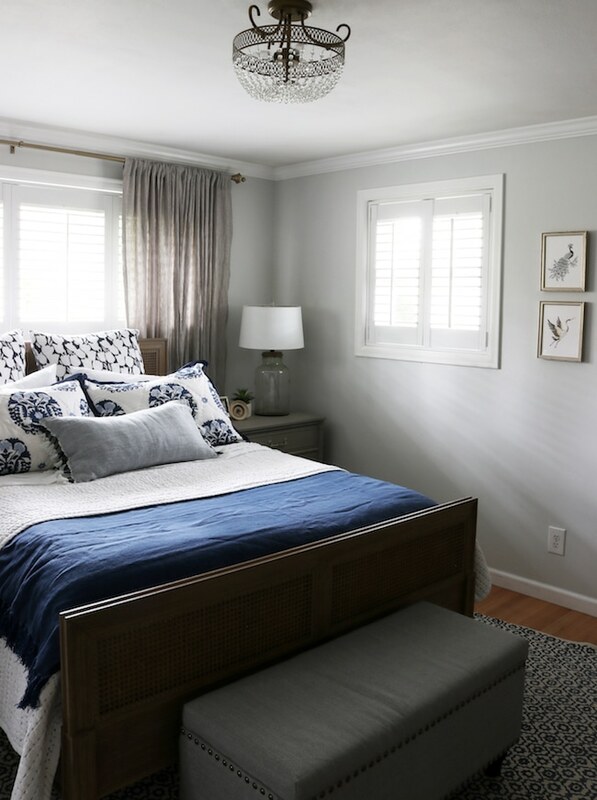 I love your walk-throughs of your rooms or re-designs because you imbed these fabulous gems like the thin legs of your new bedframe allow you to see under the bed farther and therefore give your room a more spacious feel. Makes sense but I would have had no idea! We live in a tiny space right now so that type of thing stands out. You are so good at describing and teaching. Thank you. Absolutely love the transformation. Where did you buy the curtains? Love your style! So beautiful! My bedroom is the almost identical layout; wide, short window above the bed. I love the way the soft curtains frame is so beautifully. I’m going to try this! Thank you! This is my inspiration bedroom! Can you share where you found the curtains? I absolutely LOVE your style and what you have created in a small space! Simply stunning!Thank you for sharing your home and ideas with us, it really helps me to get great inspiration of what is possible! Hi Melissa, May ask where you got the bookshelf cabinets? I love your new room color! Just beautiful!